Our firm specializes in business immigration successfully processing H-1B, L-1, E-3, TN, O and P Visas for foreign employees, performers and companies. Our immigration attorney works directly with corporations that require foreign talent. Our clientele include firms which require specialized engineers, programmers, physicians, healthcare professionals, and international transfers of employment. Our Orange County Immigration Lawyer assists corporations and their employees in PERM Labor Certification and I-140 Immigrant Petitions offering full-service immigration legal solutions to assist in obtaining Permanent Residence (Green Card). For over 15 years our immigration attorney in Orange County has helped families and loved ones reunite and obtain permanent residency through family immigration. We process a variety of green card sponsorship cases including green card for spouse, children, parents, and siblings of U.S. Citizens. Permanent Residents can file for Citizenship after 5 years in lawful permanent resident status. Certain green card holders can file after 3 years. Let our immigration lawyer assist you by helping you apply for U.S. Citizenship. 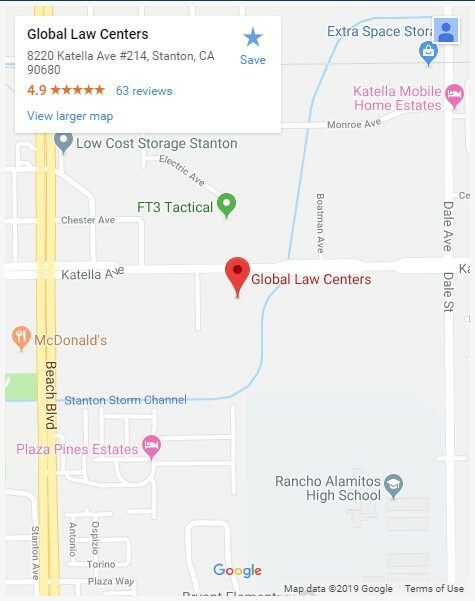 Global Law Centers provides professional, experienced immigration services to all of Orange County and surrounding areas. Our staff is fully trained in immigration law corporate, business, academic, scientific, governmental and non-profit clients. Global Law Centers expertly handles all aspects of business immigration and family immigration. We are also widely known as a firm willing to take on and successfully tackle not just the ordinary, but the extraordinary situations that can arise. Our immigration Attorney and Staff ensure that all of our cases and clients are given continuous, full and individualized attention; communication is of the ‘highest priority’; and we bring years of experience to each and every immigration matter. Successful immigration starts with a law firm solidly grounded in experience and commitment as well as a capable immigration lawyer who understands the diverse needs of the global community. Our expertise in business immigration cases such as: H-1B, L-1, Investor Visas, TN Visas, Nurses, Physical Therapists, Occupational Therapists, Physicians, Pharmacists, Speech Language Pathologists, PERM Labor Certification, EB-1, EB-2, EB-3 and Green Cards etc. Your dream is our dream. We want to make your immigration goals a reality. Please contact our office for a free consultation. If you are located in the Orange County or Southern California area we encourage you to contact us to set up a time to stop in and meet with our staff. We are confident that you will receive the help you need.